At electronica 2016 Inova Semiconductors launched the innovative ISELED technology, a groundbreaking approach for interior automotive lighting. At the same time the ISELED Alliance was announced. 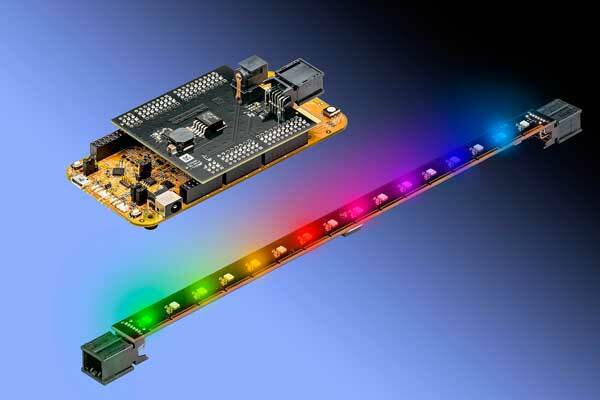 At the heart of technology is a “digital” RGB-LED, with a tiny controller inside the LED package. The Alliance is committed to create a complete ecosystem around the ISELED concept including hard- but also corresponding software. This innovative approach reduces costs, simplifies control, and expands the functionality of LED lighting in the automobile significantly. Meanwhile, initial ISELED products, including a standalone controller and development kits, are available, while more and more key semiconductor vendors, LED manufacturers, Tier 1 and Tier 2 suppliers support this pioneering technology. At electronica 2018 Inova Semiconductors along with the recently announced new alliance members – Magna/OLSA, Melexis, Osram Opto Semiconductors and Microchip Technology reported on the status of the technology and presented their new solutions to further enhance the ISELED ecosystem. These concepts and ideas today extend far beyond interior lighting ISELED was originally aiming for. It now also includes exterior lighting, an intelligent dome light, a potentially new fieldbus for lighting and sensors, and even a sophisticated dynamic backlight system for LCD panels. The next generation of in-car lighting will feature hundreds of LEDs, typically in the form of flexible light strips each comprising many single RGB LEDs, which need to be individually controlled to produce dynamic effects. Each “digital LED” on the strip consists of a red, green and blue LED chip and the ISELED controller integrated in the same package. The digital LEDs can be daisy-chained. Up to 4,079 of them can be connected via a differential bus at a speed of 2 Mbps. They will be controlled by a single external master controller. This will effectively make new applications and lighting controls possible for applications where the relatively slow LIN bus is not suitable. With a data rate of 2 Mbit/s light effects at true video speed are possible with the ISELED system. With application software developed by an Alliance member, fascinating lighting effects may be created and simply controlled by an app on a smartphone. Two years after the presentation of the concept idea and the ISELED Alliance the digital LEDs originally produced by Dominant Opto are now also available from Osram Opto Semiconductors – both meeting all performance targets. A constantly growing ecosystem opens new applications far beyond interior lighting on the horizon. So ISELED is on its way from a chip interface to a field bus. The ICN (ISELED Communications Network) will close the gap between LIN and CAN. New target applications include dome lights, intelligent sensors or actuators. First silicon will be available in 1st quarter 2019 – downward compatible with today’s products. Intelligent direct backlight is another new trend for automotive display. It offers advantages in efficiency and appearance (on contrast, real black, and seamless integration) compared to edge solutions. The innovative ISELED technology combined with high performance display control will enable dynamic backlight applications. The display content can be sent over the APIX (Automotive Pixel Link) communication link to enable local real-time calculation of dynamic backlighting from the video stream. The control of adjacent (functional) LED strips can be handled over the same communication link. At a result the fusion of display and lighting control can be implemented in one head unit and one communication link. The market increase for lighting applications is driven by dynamization and animation of light effects, electrification and autonomous driving. This will boost the number of LEDs per car. On the other hand, sub systems and clusters have to be connected. LIN is currently the major network for automotive ambient light but is limited. So, there is a need to make ISELED usable as field bus, enabling connection between several light nodes and providing increased robustness similar to LIN/CAN. Based on this background Melexis supports ISELED products with IVLN (In Vehicle Light Network) capabilities. Furthermore, the company will provide multichannel LED drivers and solutions for the sensor/actuator connection based on ISELED to support the sensor and light fusion. As developments continue toward autonomous driving light will become an integral part of the passenger cell, taking on functional and design-specific tasks. Previously static light, will be replaced by dynamic solutions with countless design options for car manufacturer. To address these needs Osram has integrated the ISELED controller chip from Inova Semiconductors together with 3 (RGB) LEDs in their new Osire E4633i product. Another key trend are adjustable white lighting designs. First solutions for adjustable white in terms of adaption of the radiation characteristics (directable light) can be found in premium car models. Osram will bring its knowledge about general lighting into the car and is working at the forefront of intelligent and ease of use solutions like the ISELED approach. In the past RGB lighting was complex in manufacturing and innovations together with the existing lighting concept have been a challenging domain. ISELED and Microchip are solving the issue bringing ease of manufacturing, scalability and innovation together. Depending on the application an 8-, 16- or 32-bit microcontroller may offer the best and energy efficient solution. 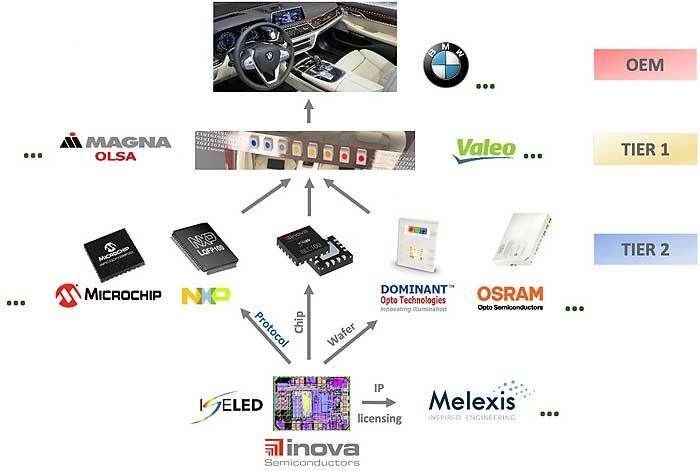 This is addressed by the broad portfolio of automotive MCUs Microchip is offering. Another important aspect is the easy, low cost and low risk development path for a fast time-to-market. Development tools, demo boards and an MPLAB code configurator enable an easy, MCU core independent and fast implementation of ISELED. In addition, customers benefit from highly integrated functions both on microcontroller and system level. The ISELED ecosystem meanwhile is very complete and continuously growing inclusive communication down to single LED. 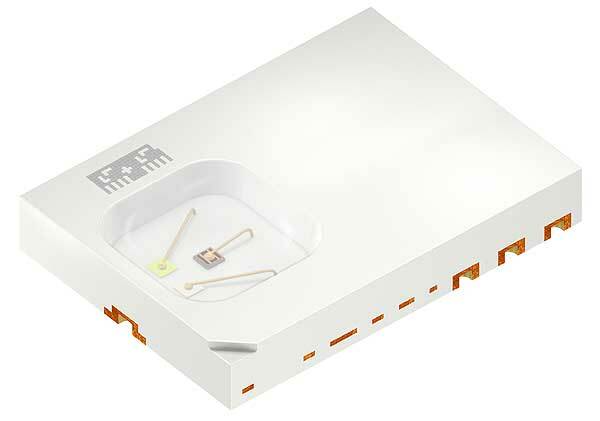 Combining smart LEDs and optics know-how allows to have resource-optimized system solutions. Magna/OLSA created the term “democratization of digital light” for high performance and cost-efficient solutions with reduced resources. ISELED support this approach, as it can be integrated into optical designs like building blocks and there is no need to care about LED calibration to design light scenarios. Magna/OLSA has built two prototypes to demonstrate adequate performance with reduced resources. A realized sensor node based on eight LEDs with “democratization” optics provides gesture detection and manages three different light status (ambient, critical and not critical).